" A poet with an expressive edge to his playing that charms, questions, and coaxes,..."
Liszt: Transcendental Etude No. 8 in C minor, "Wilde Jagd"
Pianist Daniel Hsu was the bronze medal and best performance of both the commissioned work and chamber music at the 2017 Van Cliburn International Piano Competition. Also a 2016 Gilmore Young Artist, and first prize winner of the 2015 CAG Victor Elmaleh Competition. 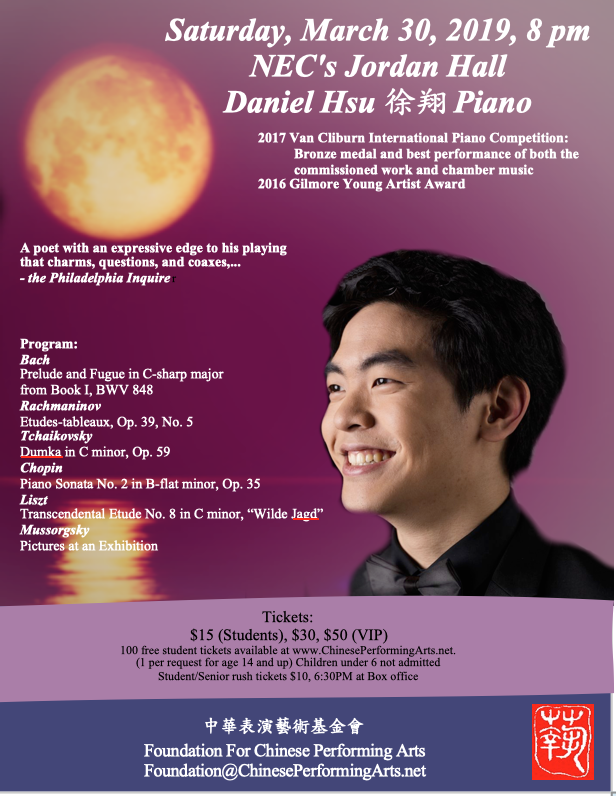 A native of the San Francisco Bay Area, Daniel Hsu made his concerto debut at age 8, and his recital debut at the Steinway Society at age 9, before being accepted into the Curtis Institute of Music at the age of 10, along with his two older siblings. Since then, he has made his debuts with the Philadelphia Orchestra (2016) and Carnegie Hall (2017) as part of the CAG Winners Series at Weill Recital Hall. Daniel has collaborated with the Tokyo, North Carolina, Grand Rapids, New Haven, and Fort Worth Symphony Orchestras, working with conductors Leonard Slatkin, Nicholas McGegan, Cristian Măcelaru, Ruth Reinhardt, and Marcelo Lehninger. Daniel's chamber performance with the Brentano String Quartet earned him the Steven de Groote Memorial Award for the Best Performance of Chamber Music. He regularly tours the US with the Verona String Quartet and in duo piano with his brother, Andrew, and appears frequently in chamber music festivals. Decca Gold digitally launched Daniel's first album featuring live recordings from the Cliburn Competition, as well as his award-winning performance of Marc-André Hamelin's Toccata on "L'homme armé." Daniel is currently the Richard A. Doran Fellow at the Curtis Institute of Music, where he has studied with Gary Graffman, Robert McDonald, and Eleanor Sokoloff. He is also a Marvel film buff and enjoys programming. He contributed to the creation of Workflow, which won the coveted 2015 Apple Design Award and was acquired by Apple in March 2017.